Thanks for liking Pushing Ahead of the Dame. Like TIME on Facebook for more trusted news analysis, award-winning multimedia & behind-the-scenes looks with TIME editors. 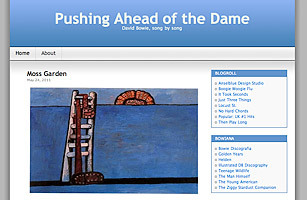 If you're a David Bowie fan, you'll love Chris O'Leary's Pushing Ahead of the Dame. Each post is devoted to analyzing a Bowie song, in roughly chronological order: its words, music, history, precursors and influence on other performers. O'Leary's been at it for almost two years and is up to only 1977; with four decades of Bowie music to write about, he may be working on it for a while. Even if you're not an admirer of the artist sometimes known as Ziggy Stardust, the site's a rewarding read. If nothing else, it may leave you wishing that your favorite musician had a fan as perceptive and prolific as O'Leary.